I decided to upgrade my previous 18 Litre "Glass Planter" Outdoor Tank which has been running for the past 2+ months. Surprisingly with slow growing plants and lot of indirect sunlight throughout the day, not much algae appeared (other than some green algae on the glass which was easily cleaned off), i guess the low-bio load and minimal nutrients probably helped to ward of algae issues. So i got a longer tank custom made to utilize the shelf space more efficiently, yet still keep to the low-profile style. The new tank dimensions are L60cm x D25cm x H18cm, quite similar to the ADA 60F tank design in terms of dimensions (though with slightly less depth). 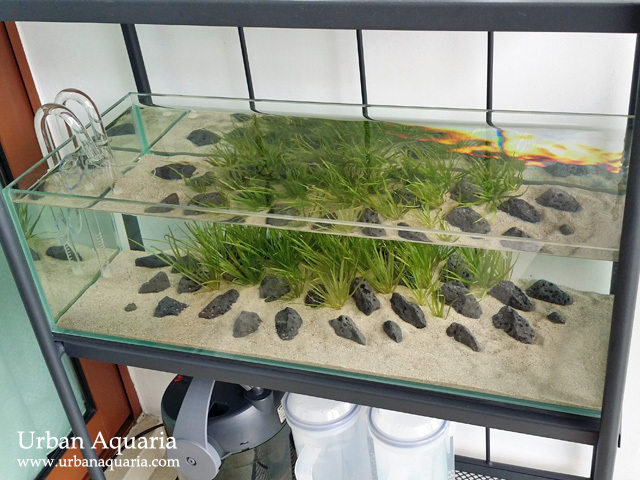 As i wasn't planning to create an elaborate scape (and i prefer it to be easily setup and taken down if required), i chose to stick with sand substrate and use the same types of small volcanic rocks. This time round i was inspired by the grassy sand dunes at beaches which just feature a simple combination of beach grass and rocks. The sand was piled up higher in the middle of the tank and the rocks were scattered down the slope. I choose to use Blyxa Japonica to recreate the beach grass look (it coincided with a plant trimming harvest from my other tanks). What i like about Blyxa Japonica is that its an adaptive plant that can grow well as a water column feeder and its easy to get an instant nice grassy hedge with just bunches of them. The tank is filtered by an Eheim Ecco Pro 130, which is in turn connected to Acrylic Lily Pipes. I adjusted the flow rate to around 70%-80% to regulate the current, to the point that there is good overall circulation and all the plant leaves are swaying gently in the current, but not too much that they get uprooted. I'd have to say that this tank is one of the fastest i've ever setup, from empty tank to hooking up equipment to hardscaping and planting to completion, all in it only took less than 30 minutes. A group of 20+ cherry shrimps (aka maintenance crew) were introduced a few hours after tank setup, the filter already contains a portion of cycled bio-media and the sand substrate is inert, so the parameters stay relatively stable for the fauna. Nice simple scape. Wondering what the fertilizing routing is like with the sand substrate. It depends on the type of plants used in the tank and their nutrient take-up rate, if they are those that can draw nutrients efficiently from the water column, then aquarium fertilizers can be dosed to supplement their nutrient requirements (just follow the dosage recommendations on the bottle and increase or decrease the amount according to the plant's growth rate). If the plants are heavy root feeders, then fertilizer sticks or tablets can be inserted into the sand near the plant roots to supply them with nutrients too. Hi there. How do you adjust the flow rate via your filter? Hi UA, may i ask if the Blyxa Japonica is doing well on the sandy substrate to date? 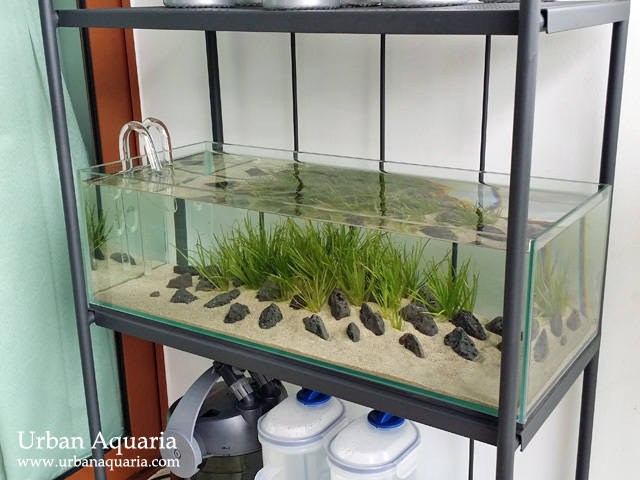 I love Blyxa Japonica and was thinking to introduce them to my setup without soil substrate. They were able to grow, though even with water column fertilizers their growth rate was still much slower than compared to when they were planted in ADA Amazonia aquasoil. I guess if you were to add some fertilizer root tablets or sticks into the sand, it may help to improve their growth rate. Hi UA, is this tank placed at your balcony? No issues with too much light? Yeah, this tank is placed at a balcony area, so it gets indirect sunlight for most of the day. The amount of light it receives does vary depending on the weather, but generally i find that if i keep the bio-load low with minimal nutrient content, algae doesn't grow much in the tank. I also keep mainly algae eaters in the tank so they help to keep it in check. I guess its that combination of those factors that help to minimize algae issues in such setups. How do you get them to stay rooted? I just increase the sand height at the back of the tank and then push the plants deeper into the sand. They naturally stay rooted from there on.